Today’s release continues to improve multiple areas of Gutenberg, its behaviours and tools. Most of the updates are around refining the experience and strengthening the API surface, but there’s also a couple new server rendered blocks added to the library. There are also multiple packages being extracted as the APIs mature. Many thanks again to all the contributors! Add “Convert to blocks” option in HTML block. Correct caret placement when merging to inline boundary. Move block switcher from header to multi-block toolbar for multiselection. Add new Archives block for displaying site archives. 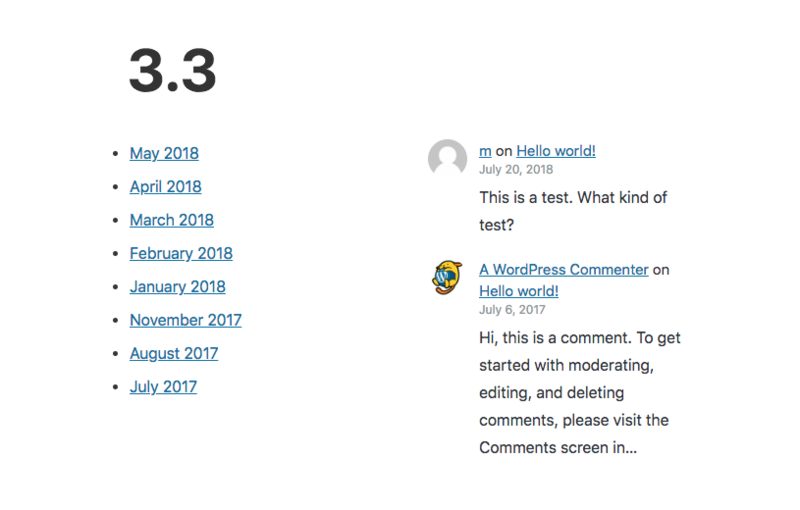 Add new Latest Comments block to widgets category. Add video block attributes for Autoplay, Controls, Loop, Muted. Remove HTML beautification and preserve whitespace on save. Formalize RichText children value abstraction. Allow transformation of image block to file block and vice-versa. Support preload attribute for Audio Block. Avoid popover refresh on Tip mount. Introduce “registry” concept to the Data Module. Hide “Convert to Shared Block” button on Classic blocks. Update spacing in pre-publish panel titles. Use do_blocks to render core blocks content. Hide insertion point when it is not possible to insert the default block. Refactor block converters to share common UI functionality. Replace the apiRequest module with api-fetch module. Add audio/video settings title to settings panel. Normalize the behavior of BlockListBlock’s “Enter” key handling to insert the default block. Rename baseUrl entities property as baseURL in entities. Rename UrlInput component as URLInput. Give File block a low files transform priority. Make tooltips persist when hovering them. Optimise design of heading line heights. Add a filter(‘editor.FeaturedImage’) for the FeaturedImage component. Fix vertical arrow navigation skips in writing flow. Fix incorrect polyfill script handles. Fix template example so that it is correct. Fix exception error when saving a new shared block. Fix getInserterItems caching bug and add new test case. Fix issue with spacer block resizing and sibling inserter. Fix files configuration entry in package.json for wordpress/babel-preset-default. Fix config and regenerate updated docs. Fix dependency mistake in api-fetch. Fix metaboxes save request (parse: false). Fix issue with name field not being focused when a shared block is created. Fix box sizing for pseudo elements. Fix an error which occurs when assigning the URL of a Button block. Improve usage and documentation of the landmark region labels. Substitute the remaining uses of unfiltered_html capability and withAPIData. Remove the “Extended Settings” meta box wrapper. Remove NewBlock event handling from RichText. Remove legacy context API child context from Block API. Remove Text Columns block from insertion menus in preparation for Try outreach. Remove unused autocompleter backcompat case. Change label in Cover Image block for background opacity. Change the text label on Image block from “Source Type” to “Image Size”. Backup and restore global $post when preloading API data. Move packages repository into Gutenberg with its history. Enhance the deprecated module to log a message only once per session. Add basic test for shortcode transformation. Add e2e test for block icons. Add e2e tests for the NUX tips. Add e2e tests for shared blocks. Remove data-test attribute from UrlInputButton output. Deprecate id prop in favor of clientId. Rename MediaPlaceholder onSelectUrl prop as onSelectURL. Remove unnecessary default prop from test. Point the package entry to src directly for native mobile. Use clearer filenames for saved vendor scripts. Update local install instructions and add add more verbose instructions when node versions don’t match. Coding Guidelines: Prescribe specific camelCasing behaviors. Regenerate docs using docs:build command. Add documentation for ALLOWED_BLOCKS in Columns. Add link to support forum in plugin menu. Deprecate buildTermTree function in utilities. Deprecate property source in Block API. Deprecate uid in favor of clientId. Deprecate grouped inner blocks layouts. Improve eslint checks for deep imports. Improve IntelliSense support when using VS Code. Move the components module partially to the packages folder. Add the blocks module to the packages folder. Add wp-deprecated dependency to wp-element. Add @babel/runtime as a dependency to wordpress/components. Add @babel/runtime as a dependency for packages. Add a new compose package. Update Dashicons to latest build. Update code to work with Babel 7. Update package-lock.json with eslint-scope version 3.7.3. That is a long list! Great work team. The Gberg experience has come a very long way.